I liked this book because of it’s imaginativity. Charlotte makes shure the sunflowers are in shape. This looks really, really good.Really Good! I REALLY want to read this book and I know it’ll be awesome! 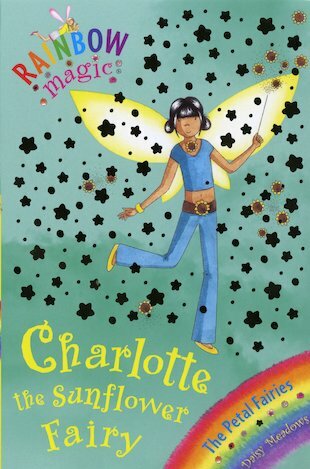 This book was ok for me but I diden`t like it that much because Jack frost is always in the way in every story but if he wasen`t in it then I would of loved it but I loved Holly the chrismas fairy the most even though Jack frost was in the way again and Iam reading Jessica the Jass fairy now I have read Holly the christmas fairy and Olivia and Charlotte the sunflower fairy and the last one I have read is Harriet the Hamster fairy and I loved that too I just love all of the Rainbow magic books ansd I also think that Iwould like the sporty fairys because it has my name in it called Gemma the Gymnastic fairy and my Mummy said that she might buy me all of the books so I am so so pleased and happy.